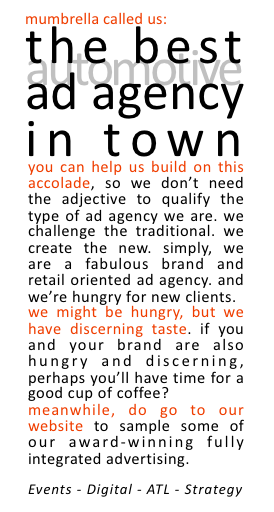 You’re advertising the advertising agency! I use that line nowadays when people ask me what I am doing for a living. But in reality, we all know an advertising agency seldom advertises itself. Not in the traditional sense of paid advertising. When it comes to the paid-owned-earned media debate, agencies just don’t pay for advertising space. Hell, we’re bad enough with our owned media (how many out-of-date websites are there and/or offices ‘soon to be renovated’). And few agencies are fabulous at sparking the conversation in earned media (what percentage of agencies goes beyond PR-ing breaking campaigns, updating a Linkedin profile and the occasional tweets?). But this piece isn’t about owned and earned media, not today. I found out the other day that Encore magazine is about to be revamped and, on top of its usual readership, it’ll be distributed among the 4,500 senior marketers on the Australian Marketing Institute’s database. And I bet the All-New Encore Magazine will enjoy heavy promotion to an even wider marketing community via its sister title, mumbrella. And so I spoke to the Encore publishing team and was duly sent the media pack with the rate card. As it happens Innocean, the agency where I work, will feature since another now-famous adman, Sean Cummins, will scrutinise our latest TV ad for Kia, part of a multimedia campaign for an irreverent brand. Here lies the debate. Should we also advertise in the publication? Well, it’s too late now, we’ve missed the deadline. So, should we have advertised? And what would should have been our message? Everyone avoids a salesman; everyone loves a storyteller. And, as it happens, we’re doing just that. Only you probably won’t see that particular story for a while, unless you’re a prospective client. We’re going DM rather than above-the-line. You see, when agencies do advertise themselves they just look like they’re clutching at straws: Ogilvy had a go earlier this year. And I’m not sure what the ads actually achieved. Their brand is well known, after all. Recency / top-of-mind awareness and that’s all, I’d guess. As reported in mumbrella, Ogilvy in Australia had a madmen dress-up competition internally (was that really press-released!) and Tom Moult’s (beautifully written, mind you) long-copy ad. Not exactly an integrated campaign and not sure it really did much for their brand or their business. But it didn’t denigrate the brand – well the long copy ad didn’t. Phew. I bet there was consternation on the inside – especially from the agency that in its old (Singo) guise refused any sort of self-promotion. Is there any great advertising for ad agencies? Either then or now? It’s my contention (after some reflection) that pure advertising for ad agencies themselves never really works. And I mean advertising, rather than self promotion.